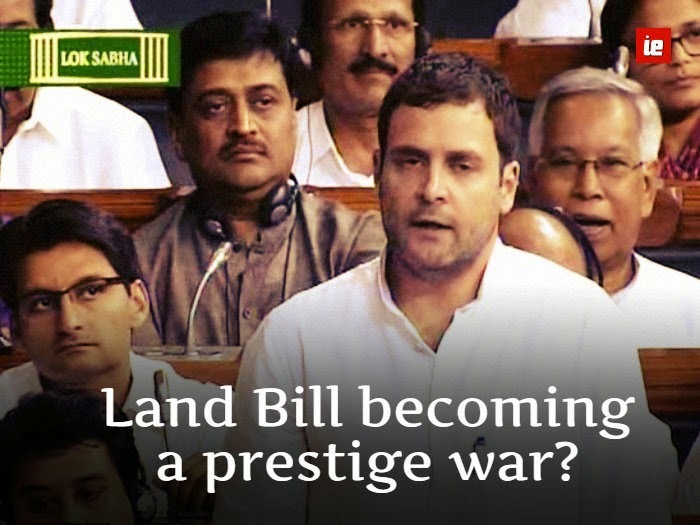 Has the Land Acquisition Bill debate been reduced to a prestige war? In 1841 ,the British Prime Minister Lord Derby said in the House of Commons “The duty of an opposition is very simple; to oppose everything and propose nothing. This holds true in today’s political situation .The Bengal Resolution of 1824 was the first such land acquisition legislation enacted by the British government and in later years the politics of Land has continued in swing with different government’s at the centre the bill has been continuously reformed and modified in accordance with the economic roadmap planned by the incumbent government at the centre. In 2013 the UPA –II government enacted the so called historic legislation which was termed “pro- farmers” and the Bhartiya Janata Party supported the UPA government legislation. The Right to Fair Compensation and Transparency bill has kicked up a storm. Being dynamic is paramount for long term survival. Now ,the Modi government is keen to make amendment to the bill for realization of pet project “Make In India” which will attract foreign investors and in a way reform the Indian economy. According to an HSBC Global Research around a third of the top 100 stalled projects which make up around 93% of all stalled projects in the CMIE (Centre for Monitoring Indian Economy) records are stuck due to land acquisition issues. According to the ministry of finance estimates that the stock of these stalled projects amounts to Rs.18 trillion and that more than half of these are from the infrastructure sector. Thus the NDA government will have to find a middle ground where the farmers have a regular source of livelihood and share in good governance. Through the populist and so called “pro-farmer” UPA II legislation ,the UPA government went on pursuing farmers but the general elections verdict proved that it did not impress the farmers , at last “ Ye Public hai sab jaanti hai” . People were fed up with policy paralysis , in-efficient governance , acute corruption and unemployment. Hence, because of societal inclusiveness and development people voted for the BJP government . For development Manufacturing and infrastructure are some of the ways forward and that demand land. The new legislation therefore, provides for a job to landless labourers in not to the farm labourers as most of them are who earn a pittance. MGNREGA has become popular and the new government continues to support it. Therefore, to say that the government is pro-capitalists and not pro-farmer is patently imprecise. The most urgent reform needed today for the growth and development is the fresh amendments as development cannot proceed without it and no industrialisation can proceed . Superpower China follows the 1999 enacted land acquisition law which allows it to take any land without approval from the owner and the result of which is quite evident. At present around 49% of Indian population is involved in agriculture and hence often its termed as “Agrarian Economy” and in return it contributes to only 13.7% of India’s total GDP. India is contemplated to have a sturdy economy but inert India is lingering far behind its competitors .The problem is quite clear. In India the government is on the whims of their coalition partners and opposition and this has led to acute policy paralysis in recent years. Political decisiveness has a major effect on the economy of the country. For example If China wants to build a rail network, it will find way through forest and villages in its course but In India, any projects faces a number of impediments like land acquisition, stringent labour laws, hoards of regulation by the environmental ministry and red tapism. This has led to adverse business environment in the country well reflected in the ‘ease of doing business’ index by World Bank placing India at a rank of 134, a well below china having a rank of 96. The Congress mega Kisaan rally proclaiming the new ordinance of being anti-farmer but they should know that the UPA II Land Acquisition Act which the present government is trying to amend in fact failed virtually across the spectrum. Industry was extremely disappointed and interestingly Congress Chief Ministers written to then Prime Minister of India Dr.Manmohan Singh, complaining that it was unfair to people and development . In fact , the Congress should answer that do they have any alternative model of governance which can reboot Indian economy . The main utility of the Land Acquisition bill is that it guarantees neutrality and fair dealing with farmers as clear norms on the process of acquiring land and rule for compensation packages will ensure that the process of land acquisition is transparent. The existing Act kept 13 most frequently used acts for Land Acquisition for Central Government Projects out of the purview. These acts are applicable for national highways, metro rail, atomic energy projects, electricity related projects, etc. The present amendments bring all those exempted from the 13 acts under the purview of this Act for the purpose of compensation, rehabilitation and resettlement. Therefore, the amendment benefits farmers and affected families in a larger context. Second, the proposed changes in the Land Acquisition Act would allow a fast track process for defence and defence production, rural infrastructure including electrification, affordable housing, industrial corridors and infrastructure projects including projects taken up under Public Private Partnership mode where ownership of the land continues to be vested with the government. Third , As per the changes brought in the Ordinance, multi-crop irrigated land can also be acquired for purposes like national security, defence, rural infrastructure including electrification, industrial corridors and building social infrastructure. The new Land Acquisition Bill promises four times the market price of the land(4X) ; Job to family who gives up land ; 1/5th of developed land to be returned back to the farmers . According to an estimate around 30 crore landless people will get employment in the industrial corridors following amendments to the land acquisition bill. It’s a need of hour to have a balanced approach. Justice to the land owner is must and one cannot be done at the cost of the other. The Opposition and other agitators are creating confusion for their own personal reasons. Land Acquisition Bill is a such law that is going to change the outlook of India in near future. Ever since the Modi government came to power, the Prime Minister Narendra Modi has been potently propagandizing for his pet project ‘Make in India’ which aims to boost the domestic economy which is the need of hour. Now, the challenge with the land acquisition bill is to balance the benefit to farmers with the cost to industry and hence a balanced approach is must. Indian Exponent: Has the Land Acquisition Bill debate been reduced to a prestige war?